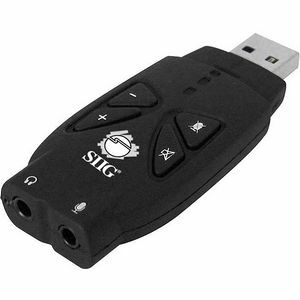 With SIIG's USB SoundWave 7.1 Pro audio adapter, adding true 7.1 high-definition audio to your desktop or notebook computer is as easy as plugging in a USB device. This USB audio adapter delivers virtual 7.1 channel surround sound, providing home-theater quality sound for your headphones or stereo speakers. Easily control your multimedia output by using the integrated volume-up, volume-down, speaker mute, and microphone mute button on the USB SoundWave 7.1 Pro from SIIG. SIIG's USB SoundWave 7.1 Pro allows you to fully immerse yourself in surround sound as it supports EAX 2.0, A3D 1.0, and Microsoft DirectSound 3D. This USB audio adapter also automatically places speakers to preferred positions without having to move actual speakers via its Speaker Shifter feature, and reduces unwanted static and noise from digital to analog processing. The USB SoundWave 7.1 Pro supports various Windows operating systems and comes with SIIG's limited 5-year warranty. Virtual 7.1 channel surround sound provides home-theater quality surround sound via headphones or stereo speakers.